The Department of Children and Families is committed to becoming a trauma-informed organization. Maxine Harris (2004) describes a trauma-informed service system as “a human services or health care system whose primary mission is altered by virtue of knowledge about trauma and the impact it has on the lives of consumers receiving services”. When an agency takes the step to become trauma-informed, every part of its organization, management, & service delivery system is assessed & potentially modified to include a basic understanding of how trauma impacts the life of individuals seeking services. This means looking at all aspects of programming through a trauma lens, constantly keeping in mind how traumatic experiences impact consumers. Programs that are informed by an understanding of trauma respond best to consumer needs and avoid engaging in re-traumatizing practices. The Department serves a variety of individuals and families with a variety of needs. Those we serve have often lived through experiences that are extremely stressful and potentially traumatizing. 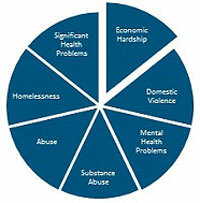 Health problems, natural disasters, economic hardship as a result of unemployment or disabilities, domestic violence, community violence, homelessness, chronic mental health and substance abuse, and other hardships place those we serve at risk for potentially traumatic events. In addition, the experience of stressful and potentially traumatic conditions put those we serve at risk for health problems, economic hardship, chronic mental health and substance abuse problems and other hardships. Seeking help can also be a source of stress and trauma if the organizations and providers are not trauma-informed. Trauma-informed services are not designed to treat symptoms or syndromes related to violence, abuse, or neglect. Trauma-specific services, which will be discussed later, are employed for treatment. Harris and Fallot (2001) describe the process of becoming trauma-informed as being analogous to the process organizations when through as a result of the Americans with Disabilities (ADA) in 1990. While not all, or even most, individuals who access public venues and events need special accommodations, the ADA required that organizations become “disability informed,” so that services are truly available to all people. It is much more likely that those served by our agency are in need of services and supports that are trauma-informed. 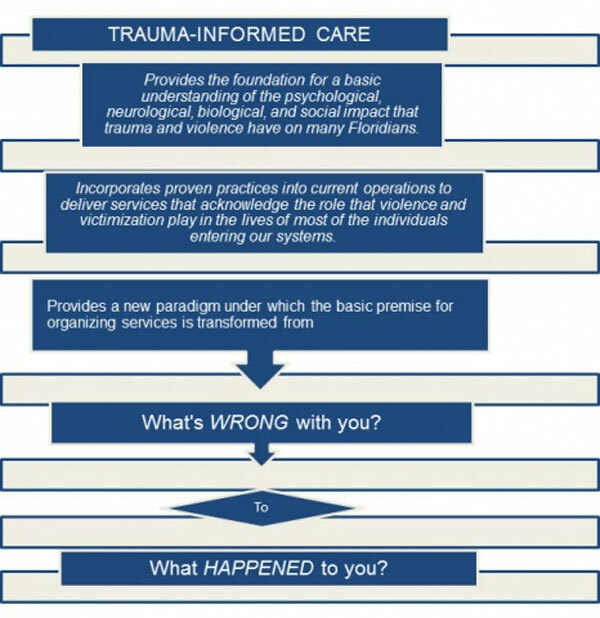 An essential step in ensuring our agency is trauma-informed is that DCF leadership and staffs are trauma-informed and fully committed to the principles of trauma-informed care. Becoming trauma-informed is a process that involves striving towards a new way of understanding people and providing services and supports. This process involves a gradual integration of trauma concepts and trauma sensitive responses into daily practice. What it looks like to become “trauma-informed” can vary from program to program. Most organizations begin with a self-assessment of current policy, procedures, and practices to identify needed changes or areas where trauma-informed and trauma-specific practices are already working well.